In addition to higher overall chip heat dissipation demands, the new approach will also have to handle on-chip hot-spots that dissipate considerably more power per unit area than the remainder of the device. Such cooling demands may be needed for future generations of high-performance integrated circuits embedded in a wide range of military equipment. "There is really no good way to address this heat dissipation need with existing technology, and the problem is getting worse because computing power is increasing and the capabilities being put on chips are expanding," said Yogendra Joshi, a professor in Georgia Tech's Woodruff School of Mechanical Engineering and the project's principal investigator. "There is a real need for developing schemes that can address high power on the whole chip coupled with very high power dissipation areas that are only a few millimeters square." DARPA's Microsystems Technology Office, which provided the three-year $2.9 million contract, is seeking techniques to dissipate heat of as much as one kilowatt per square centimeter in the overall integrated circuit, and five kilowatts per square centimeter on smaller areas. The research is part of DARPA's Intrachip/Interchip Enhanced Cooling (ICECool) program. "The approaches that we are talking about are relatively high-risk," said Joshi, who specializes in electronic cooling from the chip-level on up to full-sized data centers. "They have not been tried before, so there are real questions of reliability – whether they can hold up under repeated cycles of being powered up and powered down." Suresh Sitaraman, also a professor in the Georgia Tech School of Mechanical Engineering, who specializes in evaluating electronic device reliability through innovative characterization techniques and physics-based modeling. While applications for the high-powered chips aren't specified, their installation in systems intended for field use will add to the level of challenge. "For speed and performance issues, this computing power may be embedded where it is needed in the field," Joshi said. "The challenges of cooling these high performance integrated circuits will be even more challenging because they will operate in environments that may be adverse compared to an office or computer room situation." Implementing non-uniform cooling using liquid evaporation in three dimensional integrated circuits. The program calls for two dies to be cooled together, but the approaches developed for that could be used in multiple stacked dies. Being able to cool smaller areas with higher heat dissipation needs will provide an additional challenge. Meeting reliability standards while ensuring that the coolant and vaporization within tiny microfluidic passages does not induce liquid dry-out, passage cracking, fluid leakage or undesirable electronic performance. Fabricating micron-scale cooling structures smaller than the thickness of a hair in the integrated circuit stack and understanding the flow and heat transfer physics taking place at that scale. 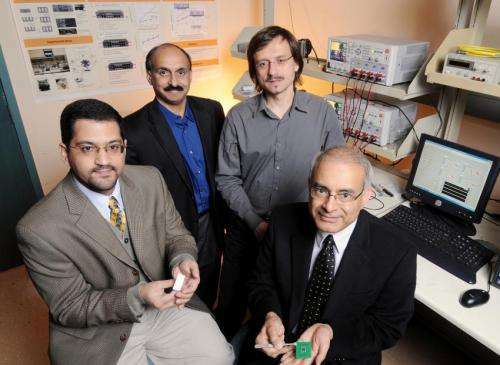 "It is well known that cooling constraints play a critical role in designing electronic systems," said Bakir. "Often a favorable electronic system configuration may not be realizable due to lack of adequate cooling. The novel microscale thermal technologies that will result from this project will address the most demanding thermal needs of future heterogeneous 3-D nanoelectronic systems and will enable new levels of performance and energy efficiency." Beyond the technology challenges, the researchers will also need to develop a detailed and fundamental understanding of how liquids boil at the micron size scale. "The physics of how liquids boil has been well studied for large systems such as power plant boilers," Joshi noted. "What we are talking about here is boiling that will take place in passages that are produced by microfabrication techniques that may be only 50 micrometers by 50 micrometers. The physics of what will be going on there is very different than what happens at the large scale, and how these liquids boil in the passages of interest will result in new scientific insights." Selecting an appropriate coolant able to provide the necessary phase change performance – while not damaging the silicon chips – will be part of the project. In an earlier research program supported by the Office of Naval Research, Georgia Tech developed new coolant candidates that will be considered along with traditional dielectric fluids. The research will be done in collaboration with industry partner Rockwell-Collins, a major manufacturer of electronic systems for the military. That collaboration will help ensure that solutions developed will be compatible with defense system requirements. "The challenges for material characterization and physics-based modeling are to consider the larger features of the electronic system without overlooking the micrometer and sub-micrometer scale features that are the main locations for fracture and failure," said Sitaraman. "Mechanical characterization and physics-based modeling will be important to understanding the reliability of microelectronic systems operating with fluid passages." Beyond meeting the project requirements, the research will produce technology advances that should be broadly useful for future microsystems. "The technologies we have proposed aim to explore uncharted territory in multiple science and technology domains to bring about an order-of-magnitude improvement in the current state-of-the-art," said Fedorov. "The project represents a significant challenge on the most fundamental level of materials and fluid behavior down to the sub-micron scale. We're confident that this project will produce some really new technologies to address the needs of future 3-D microsystems."